It is up to employers to make efforts to keep their employees safe. When an injury occurs at the workplace, employers must have a system set up to ensure that their employees will be compensated for their injuries, and that access to this system is readily available. Any workplace environment has hazards. 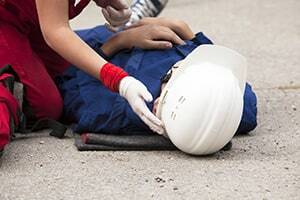 From an office to a warehouse, there are a number of accidents that can occur for all employees. Workplace injuries in non-hazardous environments include things like long-term illnesses stemming from repetitive motions, and sometimes even mental illness brought on from workplace stress. Not everyone works in an office, however, and certain environments have much higher degrees of danger than others. Injuries that stem from more hazardous workplace environments can include short term and immediate injuries such as broken bones and concussions, or they can include long term effects from exposure to hazardous substances such as chemicals or radiation. When a person wishes to initiate a Workers' Compensation claim, they must first begin the claim through their employer. As soon as a person is injured in workplace environment, their employer should already begin the process for allowing them to open a claim. Most compensation claims are sought out through the New Hampshire Department of Labor. A majority of the time, for serious and clear physical injuries, an employee will be in direct contact with their employer's representative responsible for handling worker's compensation. If an injury is less obvious, or is something that has built up over time, the employee may need to begin filing the claims process on their own. Employees must notify their employers within two years of the incident that caused the injury, or within two years of becoming aware of related medical conditions. Once this is done, the employer must either file the claim with their Workers' Compensation insurance company, or they must deny the claim. If a claim is denied, the employer can request a hearing with the New Hampshire Department of Labor. After a denial, an employee has 18 months to request to move the case to a hearing. At these hearings, the employee may be represented by an attorney. This is highly recommended, as these hearings are serious legal proceedings that are heavily weighted on evidence and argument. Employees can submit evidence they feel is necessary, such as medical records and other expert testimony. Once a hearing is decided, the losing party may appeal the decision within 30 days. Workers Compensation claims are not the same civil lawsuits, and do not rely upon any negligence or fault. Instead, these cases rely on showing that the injury or medical condition exists, and is work-related or happened at work. Workers' Compensation is designed to obtain fast and effective compensation for workplace injuries for employees who have had to leave work, take on fewer hours or responsibilities, or cannot work due to injury. If you or a loved one is involved in a Workers' Compensation case in New Hampshire, contact the legal team at Tenn And Tenn today.